Scouts, leaders and parents gathered today at the troop's meeting location, First Presbyterian Church, to join with church members for one of several Saturday-morning work days the church hosts each year. The troop participates in these as a way of giving back and saying "thanks" to the church for hosting the troop's meeting and other activities. In this way, First Presbyterian Church is a vital partner, along with our charter organization, the Auburn Rotary Club, in the success of our troop. ...and general and post-project clean up of the church grounds. 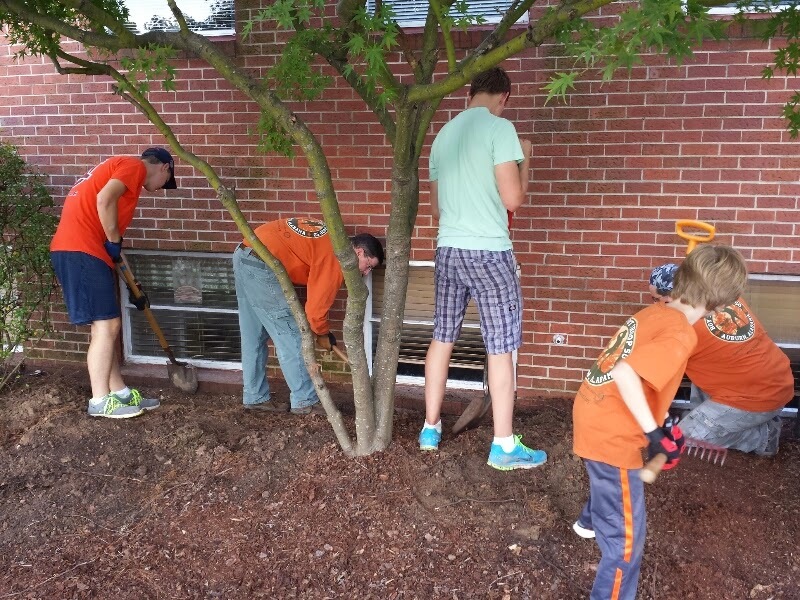 Nearly 20 troop volunteers assisted with the work day and collectively logged more than 60 volunteer hours on the troop's behalf. See more photos from the work day on the troop's online photo album.